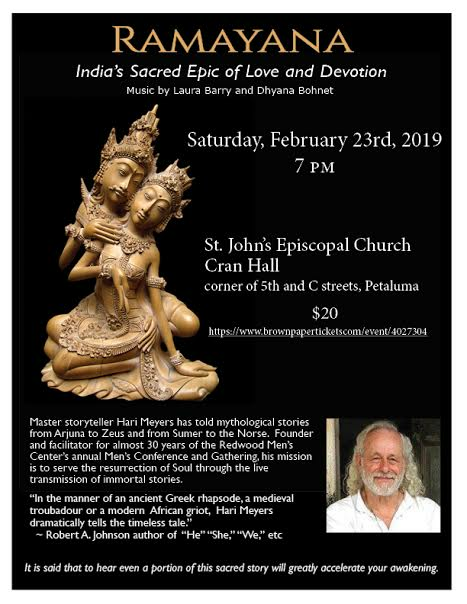 Master storyteller Hari Meyers has told mythological stories from Arjuna to Zeus and from Sumer to the Norse. A founder and facilitator for almost thirty years of the Redwood Men's Center's annual Men's Conference and Gathering, his mission is to serve the resurrection of Soul through the live transmission of immortal stories. "In the manner of an ancient Greek rhapsode, a medieval troubadour or a modern African griot, Hari Meyers dramatically tells the timeless tale." Robert A. Johnson, author of "He", "She", "We", etc. Hari comments, "I believe that the live transmission of stories, theater pieces, wisdom of all sorts contains a vibrant quality of Soul which is absent in the same material relayed via media. 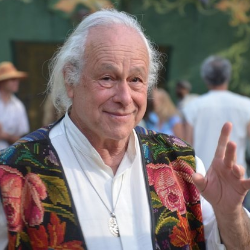 In a live performance, storyteller and audience merge as one deeply receptive entity."